Homebuilder Videos.com: Instructional DVDs and videos for aircraft builders. Our simple goal is to educate and entertain aircraft builders and pilots (and those who are still thinking about building their own airplane!). We offer a growing selection of quality DVDs created by professionals. 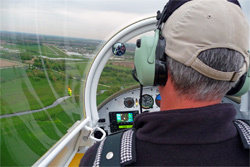 Homebuilt and kit airplanes can offer higher performance and far more "bang for the buck" than factory-built airplanes. Not only are they great to fly, the building process is so fun it can change your life! Check out our selection of videos, and stay tuned for more titles coming soon.